The Wagah border closing ceremony on the border of India and Pakistan is possibly one of the most bizarre tourist attractions I have ever seen, up there with the abandoned pyramid in Tirana, Albania but a little more interactive. From the moment we arrived to swarms of touts selling Indian flags and hats proclaiming ‘I love India’ we knew this was going to be a spectacle. Waving a ‘no thank you’ to the hoards of rickshaw cycles lining the road, we began the 1km walk in the desert-like heat. Just as the lines began to form we were ushered to the VIP line and a gloriously free pathway all the way to our designated tourist section of seating. After all the grossly inflated tourist prices in this country it felt great to get a bit of special treatment and not arrive at an attraction feeling ripped off. crowds at the wagah border ceremony, Amritsar, India. Wagah border parade! Being the on-to-it travellers that we are we had arrived an hour and half early to get a seat but the foreigners section makes this completely unnecessary. Although the area was full by the start of the ceremony we could have rocked up 10 minutes before the Wagah border ceremony and still found a spot between the families waving flags and groups of teenagers taking selfies of anything and everything. 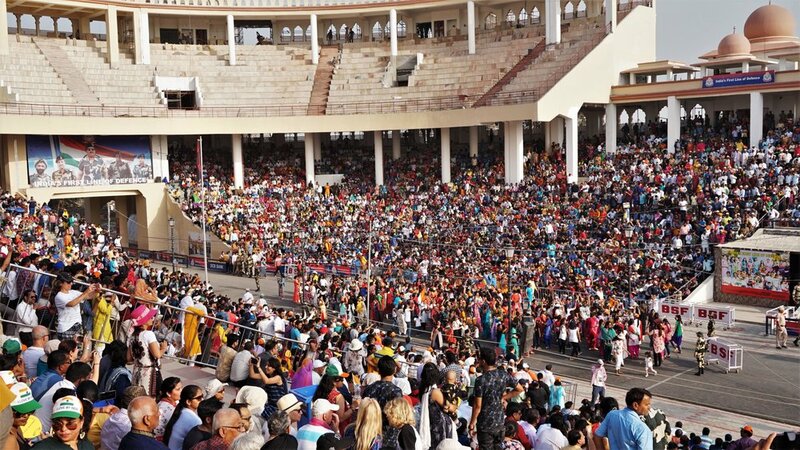 Crowds of around 10,000 gathered around us in the stadium seating on the Indian side of the Wagah border. To our right, our first views of Pakistan consisted of a more subdued crowd, some official looking people and a couple of tour groups. At around 4pm the real action kicked off and we prepared ourselves for the world’s most obscure border closing ceremony. Views of the crowds at the Wagah border ceremony, amritsar. Wagah border parade at the Indian - Pakistan border. As the Bollywood music began blaring from all angles, crowds of people queued up to run a small circle carrying the Indian flag. This was followed by a dance party in the middle of the road which spilled over into the stands of people watching. Meanwhile on the Pakistani side, a teenage boy dressed in the colours of the flag performed some awkward hip-hop type moves in an attempt to encourage the crowds. He was then supported by a one-legged man who carried a flag and spun around in circles. All this while armed gunman stood watching on with either side of the Wagah border. We sat there in our tourist stands completely bemused at what exactly we had come to see. After all this build-up the actual Wagah border ceremony was slightly underwhelming, but only slightly. The decoratively turbaned guards on either side performed their comical marches ending in over the top ‘challenge’ poses. The two groups simultaneously lowered their flags and the gates were closed for the night. We joined the mass exodus from the stadium and headed back to Amritsar, not entirely sure what to make of the Wagah border closing ceremony. Pakistani guard at the wagah border ceremony, the wagah border closing parade is a must-see in Amritsar. Wagah border parade. It’s a completely bizarre but really interesting experience if you’re in Amritsar. We highly recommend visiting the Partition Museum before witnessing the Wagah border ceremony as it gives a brilliant insight in the separation of India and Pakistan and even explains a bit about the border closing ceremony. 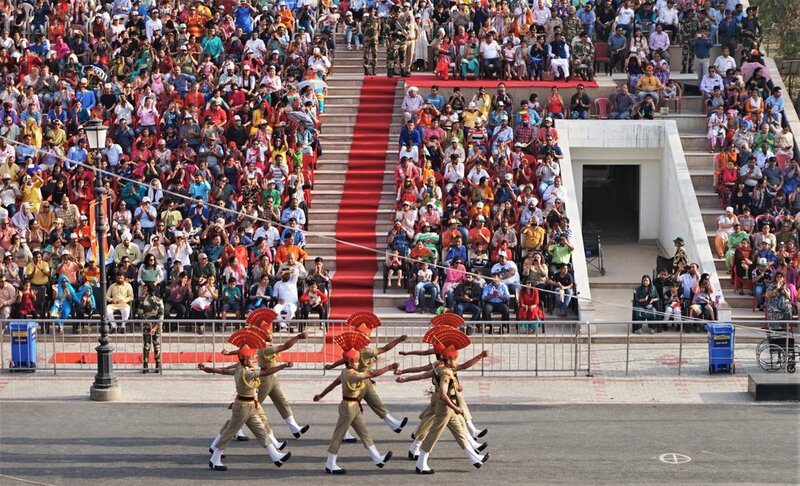 Here’s everything you need to know for seeing the Wagah border closing ceremony. There are several ways to get to the Wagah border ceremony from Amritsar. The cheapest is by shared minibus which costs 100INR per person return. You can buy tickets from the many touts on the main street to the Golden Temple. The hop-on hop-off tourist bus also stops at the Wagah border. A normal ticket costs 250 INR and the bus leaves at 2.30pm. As a foreign tourist you don’t need a ticket to visit the Wagah border ceremony. Besides getting there it is free to watch. Indian visitors can freely sit in the open seating but need an invitation for the VIP area. 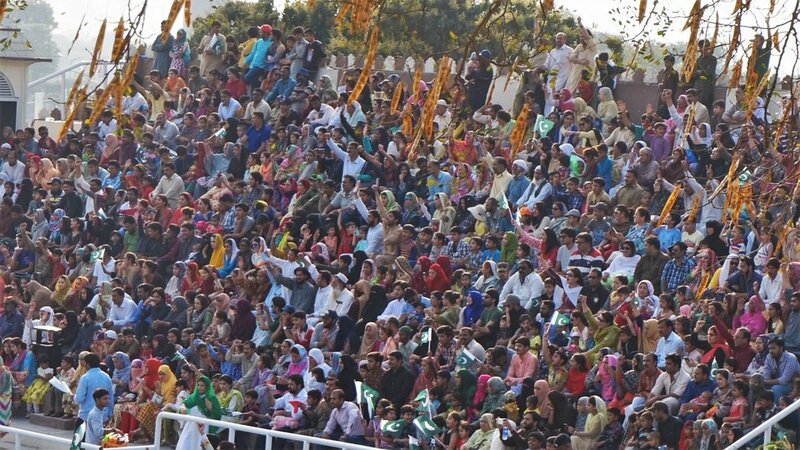 crowds on the pakistan side of the wagah border watching the Wagah border parade closing ceremony. We were told to arrive early to ensure we got seats, this may be the case in the general seating area which got very full. But in the VIP area there was plenty of space right up until the build-up began and even after space could always be found. We left Amritsar at 2pm and arrived at the stand around 3pm. The music and dancing began just after 4pm and the official ceremony began a 5.15pm. The timing changes depending on the season so make sure you double check before you go. The whole ceremony lasted around 25 minutes. wagah border gates open at the Wagah border parade closing ceremony. It was very hot when we were there and most of the stands aren’t covered. Make sure you bring water and sun protection. You’ll want to take a camera too. There are people selling snacks and drinks in the stands. You can’t take bags to the Wagah border closing ceremony so make sure you leave them at home or in the taxi. You also can’t bring cigarettes, lighters or anything that might be used as a weapon. Safest to stick with just water and a camera. If you are in Amritsar visiting the Golden Temple then a trip to the Wagah Border is a must-see. A bizarre and interesting attraction that's totally different from anything else you'll see in India!